This is not your typical Christmas story – this family cannot recall ever having spent a Christmas together until Christmas 2015. David Bleacher was overcome with emotion and is convinced that Christmas blessed him with the very best gift he could ever have wished for. In his words, ‘I was telling them at church… What else could you possibly want for Christmas?’ Now that he has his family, his life is complete. His is a story that tugs at the heart strings, because David Bleacher had not seen his sister Jean Stevens for over 40 years. Their planned meeting on Christmas was the most beautiful reunion that anyone could have hoped for. On Christmas Day, Jean Stevens hosted her brother in her Lititz home. Bleacher is a resident of Lancaster City. Surprisingly, Bleacher, 57 and Stevens, 60, have no recollection of their biological parents. Back in the 1960s, David, Jean and their brother Edward who is the eldest of the trio, were housed at the Neffsville Brethren Orphanage. Jean Stevens had been adopted by a Mannheim Township couple – Ken & Vivian Warfel, while David and Edward were adopted by Ken & Geneva Bleacher from Highville. The good news is that the families made a conscious decision to meet up several times per annum. David Bleacher fondly recalls his meetings with the Warfels and they were often referred to as Aunt Vivian and Uncle Kenny - despite there being no blood connection. By the time the children had reached high school, the siblings parted and had not seen one another since. David Bleacher joined the U.S. Navy, and after being discharged he qualified as an electrician and applied himself at several companies in the area. Edward Bleacher joined the US military. For the sister – Jean Stevens – it was to be a married life with a son daughter, Joshua and Jessica. Stevens has since divorced and began working at the Kissel Hill Scanning Department. The family lost touch with one another for decades, until a serendipitous turn of events unfolded. David and Jean would never have believed how they would be reunited – by playing an online strategy game. David Bleacher was the captain of one of the leagues in Stormfall: Age of War. This high-octane, MMO strategy game features Castles and Warlords and interactive entertainment. Bleacher was dismayed that an enemy combatant from a different league had attacked one of his member’s castles. What happened next was quite extraordinary: Bleacher inked a letter to the other league’s marshal warning of retribution if the attacks continued unchecked. The marshal took the warning to heart and decided to post it at the chat room of the game. This is where it gets really interesting: Jean Stevens was part of the other league. She scanned the chat room noticeboard and noticed that the name was the same as her brother's name. The likelihood that David Bleacher was her long-lost brother was slim to none. Stormfall: Age of War is owned by Plarium – an Israeli enterprise – and it features millions of global users. The vast majority of players are based outside of the US. Regardless, Jean Stevens got really curious. She decided to put her detective skills to the test and searched for David Bleacher on social media sites like Facebook. What she found was a photograph of Harvest Bible Church – previously known as Lancaster Moravian Church. Following her discovery, she typed up a quick note for the game’s chat room asking if David Bleacher's parents were Geneva and John Bleacher. It must be said that the siblings were a little nervous about meeting up after so many years apart. However they were excited about the prospect of reuniting. In fact, they only lived a few miles apart, and in the run-up to their meeting had spoken several times. Christmas Day however was the first time that the brother and sister had seen one another since the 1960s. Thanks to Stormfall: Age of War, Plarium has arranged for the siblings to have an extra special dinner together when they meet up again at the Appalachian Brewing Company, in Lititz Pennsylvania. For Jean Stevens this was a Christmas gift she would never forget since she had all but given up hope of seeing her brothers again. 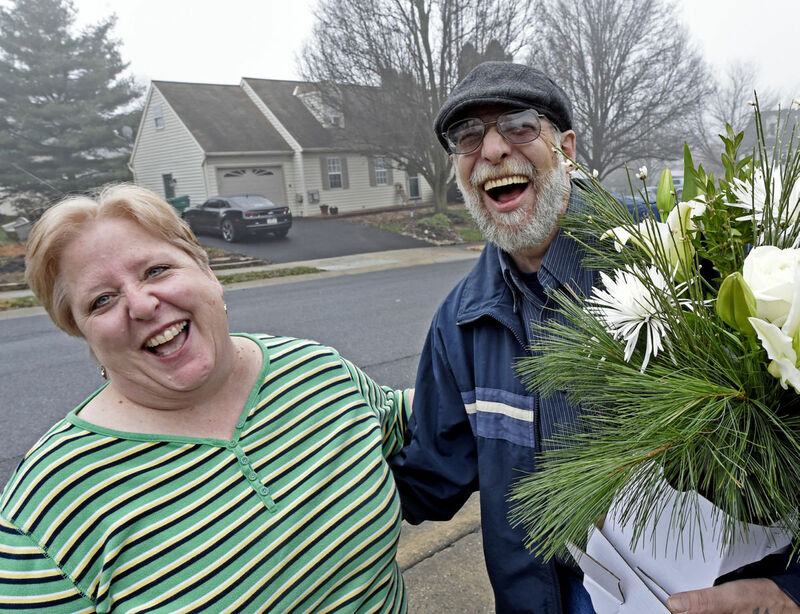 The brother and sister pair warmly embraced on her driveway on Christmas Day and David Bleacher had a beautiful bouquet to give to her. Although they had aged some, they both instantly recognized one another. They always felt comfortable around one another and their sense of humor is very similar. They know that they lived different lives with different families, but they are happy to be reunited and determined to find their other brother Edward. Perhaps their inspirational story will lead to news about Edward. David Bleacher admits to seeing Edward once every year for a while, but then they lost touch with one another for decades. For this Christmas however, David Bleacher is over the moon to be reunited with his sister. He admits that celebrating the holiday with his family is a truly magical affair, and it's all thanks to their mutual enjoyment of Stormfall: Age of War! Join David and Jean as well as millions of others in Stormfall: Age of War!